They did not know each other, but simultaneously, their lives were plunging into an abyss. Six years ago in mid-March, a bid for democracy known as the Arab Spring spread to Syria with demonstrations across the country. Three days later, at a large protest in Daraa, on Syria’s southern border, security forces opened fire on demonstrators. Syria then cascaded into a horrifying civil war. For the Alhamden family living outside Daraa, life went topsy-turvy. At the same time, in Kirkland, Washington, software programmer Cari Conklin was recovering from a ski-accident brain injury, watching her marriage disintegrate, and wondering what had happened to the life of meaning she’d dreamed of. “I was consumed with my own problems and had no capacity to consider what else was going on the world,” she says. She would find out. 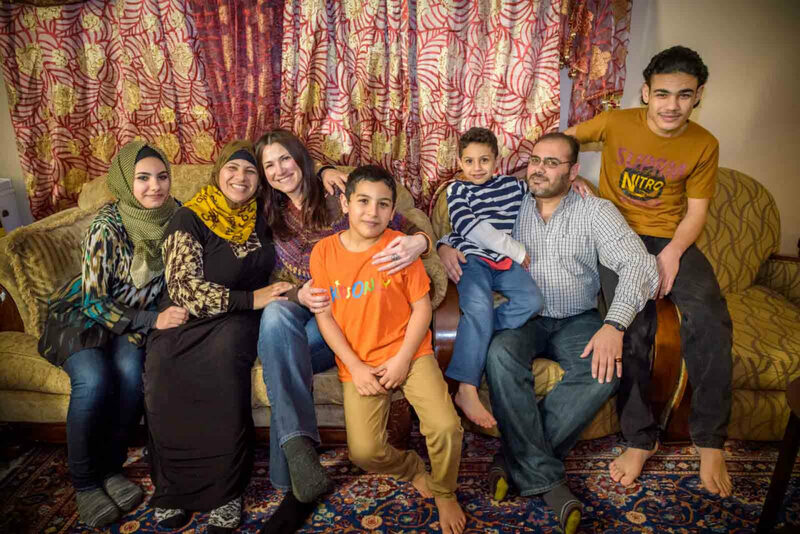 Cari Conklin was on a collision course with the Alhamdens, one of the millions of Syrian families caught in the crossfire. Bassam Alhamden and his wife, Rabah, have six children, the youngest 7, the oldest 21. Bassam had a steady job as a security guard in a village outside Daraa, in southwestern Syria. Rabah made things grow. “I used to grow tomatoes,” she says. “I would sell them in the market.” Her other crops were spectacular. There were trees — 80 olive, 50 pomegranate, and seven fig. She grew green beans, mounds of strawberries and all kinds of grapes — black, red, and green — fenced in with live cactus. In March of 2012, the airstrikes began. In January 2013, the family made the difficult decision to go to Jordan — just a few miles away. “There’s a river by the border where the injured would be taken,” says Bassam. They crossed there, wading through shallow water to an uncertain future. 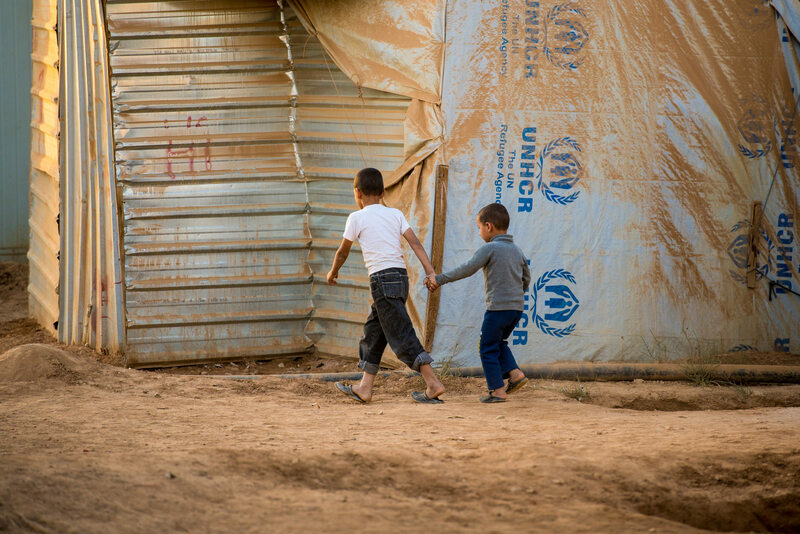 After living in the village, with fresh air and a garden teeming with vegetables and fruit trees surrounded by the cactus fence, Jordan’s Za’atari refugee camp — bulging with 80,000 people, no electricity, and no opportunity — was a nightmare. “There were times we would prefer to die in Syria than stay in Za’atari,” says Bassam. One morning, when oldest son Mohannad went to search for bread, he touched a metal building and was electrocuted. Rabah came running to find him unconscious and being given CPR. When she saw his toe move, she knew he was alive. After seven months in the camp, they registered to go back to Syria. They’d take their chances. “We gave away all our possessions,” says Bassam. “I dressed my children in the night,” says Rabah. Everyone was ready to go. At 2 a.m., the phone rang. “A family member said, ‘You can’t come. There was an airstrike that killed 14 people in our village,’” says Bassam. The family began to weep. They had given away all their belongings and had nowhere to go. Kind neighbors gave them a few possessions, but now they had next-to-nothing. Bassam went quiet. “I was shocked.” He said yes. The UN caller could not tell him which country they would be going to, but Bassam knew that anyplace was better than the refugee camp. Then began 18 months of interviews, each lasting five hours. Everyone in the family would be interviewed numerous times to ensure their stories corroborated. Bassam’s family was accepted. They learned they would be moving to the United States. A month later, the family went through a four-day orientation about American culture, especially how to get by at the airport. After a long flight from Jordan through New York and Chicago, in November 2015, they arrived in Seattle. Cari Conklin was waiting for them at the airport. Cari, 48, grew up north of Seattle in Mill Creek, Wash. She learned to be an accountant under the tutelage of her mother, but learned software programming when Bill Gates and Paul Allen turned a place known for lumber, passenger planes, and grunge music into a cyber metropolis with the growth of Microsoft. She had married, hoped for children, but knew that dream had died when her 23-year marriage ended in divorce. Another dream had died as well: her dream of mission work. When Cari was 10, her father had taken her on a mission trip to Honduras. The memory of hearing “Cristo,” the name of Jesus, sung in Spanish, had stayed in her heart. Seeds had been planted. But in November of 2014, Cari was on her own. She had recovered from neurological complications from the skiing accident and subsequent spinal tap gone awry, followed by the dark days of divorce and emotional healing. She was dating a man who sponsored children through World Vision. But she had more to give. The way forward happened on a bus. The man Cari was dating was applying for a job at World Vision, and she was praying for him as she rode the bus from work in Seattle to her apartment in Kirkland, across Lake Washington. Two years ago, on the King County Metro Bus heading to Kirkland — Cari, tears streaming down her cheeks, knew she had been called to become a World Vision Child Ambassador. In 2015, Cari visited World Vision headquarters in Federal Way, Wash., with other Child Ambassadors to learn more about the needs of the world. Cari then became a World Vision Refugee Responder, raising money to help World Vision serve refugees from Syria, Iraq, and South Sudan. But Cari was just getting started. In the fall of 2015, when the body of Alan Kurdi washed up on a beach in Turkey, Cari knew she had to do more. Through a friend who worked with World Relief, she was among a group who greeted the first Syrian family to arrive in Seattle that November — a family that had escaped Syria, lived through hell in Jordan, and were given the miraculous opportunity to move to the United States: Bassam Alhamden, his wife Rabah, and their six children. In getting to know the Alhamden family, Cari’s circle of friends in her community widened as well. There was Julie, who took the family in for the first 15 days after their arrival, and two couples in Federal Way who housed them for another month. There was Methal, who grew up in Syria, who made a welcome sign in Arabic for the family’s airport arrival. The sign, written in a language they knew, made them cry with joy. Cari’s family was suddenly much bigger. 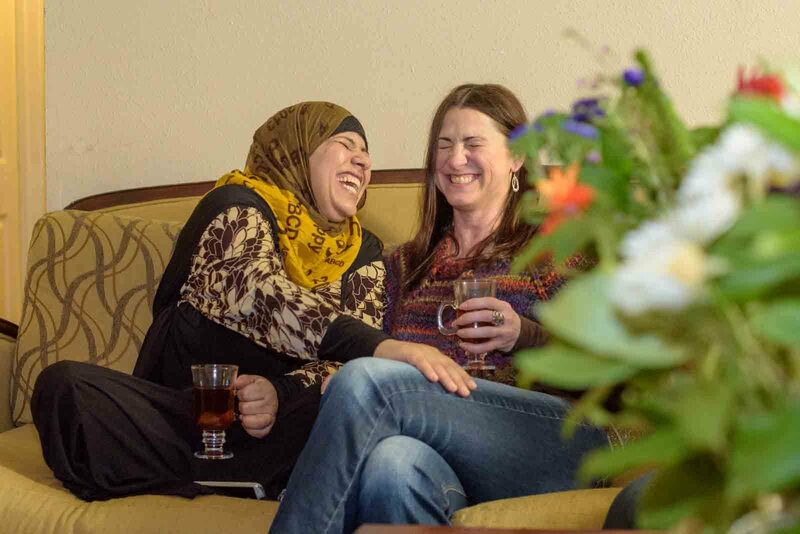 To see Cari with the Alhamden family in the West Seattle apartment they found through World Relief and Muslim Housing Services is to see a prophecy fulfilled. “You will someday have many children, but not necessarily your own,” the pastor had told Cari. Today she has six sponsored children around the world, three boys and three girls, and six more beautiful children to love from Syria. There have been so many good moments. They’ve shared Thanksgiving, decorated Cari’s Christmas tree, and celebrated a January 1 birthday bash for youngest child Ahmad, who is 7. “Or 7-ish,” says Cari. 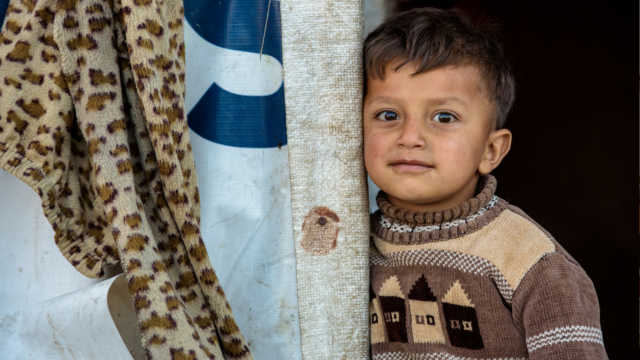 Like Ahmad, many refugees take Jan. 1 for their birthday if their records have been lost in the war. There have been challenging moments. For Ahmad, now scampering happily around the apartment, the transition to a new location was challenging. There have moments of pure crazy as well, such as the first day of school. “She came at six in the morning to make sure everything went great,” says Bassam. It was sheer pandemonium that morning. “It was like a fire drill,” says Cari. The family learns through Facebook or WhatsApp about the deaths. So far they have lost 20 family members to the war. Bassam hopes to start training to become a security guard. Their oldest son, Mohannad, 21, who survived electrocution at Za-atari camp, has applied to intern at a nearby hospital this summer. He’s hoping to become a nurse. Yara, 17, goes to Seattle’s World School with other students learning English. Although everything is new and different, she says she’s happy. She has friends and most importantly, she feels safe. Their four younger siblings attend school as well. Watching the news from Syria, the family sees the suffering. 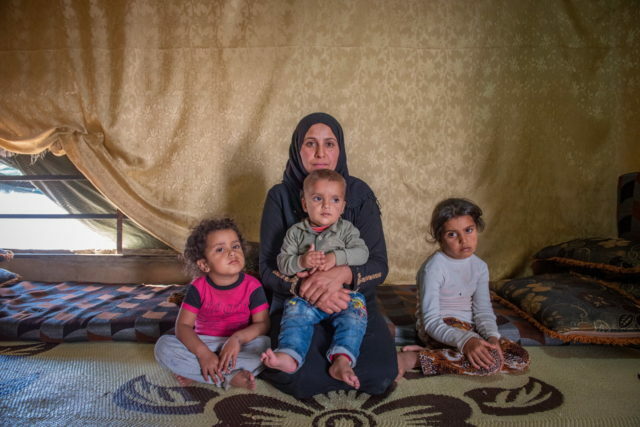 “They need medicine and food,” says Bassam, of those left behind. But that doesn’t stop her from cooking delectable meals. Cari says she has gained 10 pounds from Syrian cooking. She’s able to spend much more time with the family since she recently moved from Kirkland to West Seattle — just to be closer to them. In August 2016, Cari learned that Shakila*, who had fled Afghanistan for safety, needed a place to stay. There was one catch: Shakila was two weeks away from giving birth. “When I learned she was pregnant, I thought, ‘I have to take her’,” says Cari. She gave her new roommate a baby shower and two weeks later, Kayenat — a bright, beautiful girl — was born. The two women are connected by their love for one another, for children, and unexpectedly, through World Vision. Shakila worked for World Vision in Afghanistan before fleeing. In responding to the greatest humanitarian crisis of our time, Cari Conklin is living out her mission. “Welcome Home Refugees — Washington State,” a Facebook page she started with her Syrian friend Methal, now has 1,700 followers. She continues to volunteer for World Vision as a Child Ambassador and a Refugee Responder. And World Vision can because of people like Cari — Child Ambassador, Refugee Responder, and friend. The Syria civil war has killed hundreds of thousands of people and forced more than 11 million from their homes.